Elegance is the ultimate feat you will get when you doll up your floor with this Versace marble floor medallion. It’s unique and simple designs and patterns make it an interesting floor design that will help you make statement with your floor. It is one of the things you can’t fail to notice the moment you set your foot in the room. Most interior designers use this medallion to create a focal point in the house, which will help to capture the attention of whoever enters your house. So, it’s a simple but effective way of defining your taste and style. 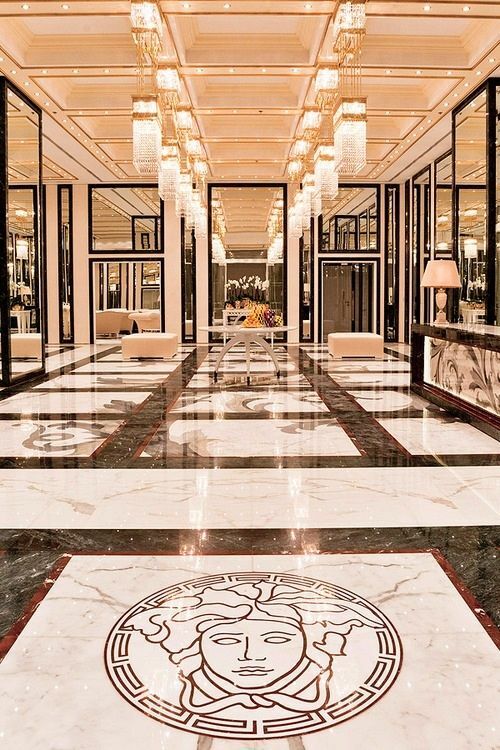 By combining a range of neutral colors, this Versace marble floor medallion presents an outstanding piece of art that brings life and elegance to your house. It is made up of dark Emprador, cream Marfil and Bianco Calacatta, which mix up together seamlessly to create a beautiful mosaic that will make a large part of your interior design. These are natural colors that present a touch of freshness, resourcefulness, and comfort. What’s more, it can be used together with other unique interior décor elements to bring out a real sense of completeness and creativity. Another good thing about this marble floor medallion is that it is highly versatile. In order to create a complete and unique interior design, you need elements that work harmoniously with each other. With this floor design, you do not need to look for different flooring elements for different spaces because it can fit virtually everywhere in the house. It has proved to work in living rooms, bedrooms, bathrooms, dining rooms, kitchens, and even foyers. This makes it a simple and economical way to dress up a house. It saves you time and money that you could have spent on different floor designs for the entire house. And because of its neutrality, this marble floor design works with almost any other type of interior design. You can be as creative with your walls and ceiling designs as possible without worrying about the floor because this medallion is created to complement other décor elements. Above all, you won’t have to worry about changing your floor every now and then because this marble piece of art is designed to last through the ages. Plus, it does not require a lot of specialized maintenance; you just need to keep it clean and protected against scratches and stains. It’s a great way to customize your floor. Posted 3 years, 11 months ago at 6:06 am.